When mache is ready to pick in January it is a cause for celebration. This little plant is tender, with a smooth texture and has a long season to harvest. We like the tender young plants and use them as we thin. Later we pick the larger leaves until mid spring. The first salad we make is this traditional salad of mache, beets and lightly toasted walnuts. touch of olive oil and a bit of salt. It is a classic French salad and I urge you to try this, it’s like the first bite of spring. Pressure cooking beets. Add a perforated steamer and enough water to just come to the edge. This is fast but inconsistent and I’ve needed to cook these beets anywhere from 5 to 15 minutes depending on size and maturity. So far they come out like roasted beets with their juices retained and tender. I usually cook enough for another salad as cooked beets last several days when refrigerated. Kale Salad with Quinoa, and Black Kabuli Garbanzo Beans. It seems we’ve moved into that time of year when a good selection of food from the garden becomes a bit scarce, what in olden times was called The Hungry Gap. Making a salad becomes a mix of what is in the house and garden. Yesterday’s salad was based around the ever reliable kale. It’s getting a little tough but stripping it off the stem, tearing it into small pieces and then massaging with a small amount of olive oil renders it rather succulent. We’re offering a new garbanzo this year, Organic Black Kabuli Beans. The skin is very dark, almost black. Decided to simmer it three minutes like we often do with any bean. Set it aside and tasted a bean that was nearly cooked, gave it another round of three minutes at a steady simmer and repeated. So all in all pretty impressed and it has a fine flavor. So back to the salad, add some quinoa to the kale, some chopped apple and an orange. Add a bit of olive oil, lightly salt, sprinkle on a little chipotle pepper, some rice vinegar, You see it’s turning into a delicious melange that can’t ever be totally repeated but that’s what is nice about salads…we just make them. Take this mix and lay on a plate covered with arugula or lettuce leaves top with a good handful of Black kabuli chickpeas/garbanzos and crumble some feta over the top. Little of this and a little of that makes a good salad this time of year. Hope you are enjoying your garden as days grow just a little longer. 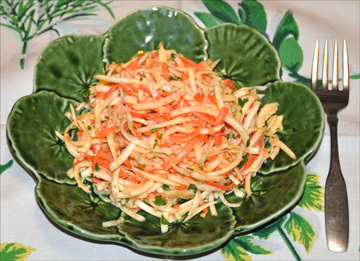 Fresh sauerkraut salad is one our winter favorites and is fast and easy, once you have the sauerkraut of course. As many know, my husband Keane makes wonderful kraut. If you’d like to see this instructional YouTube and learn to make sauerkraut in a gallon jar. Since we don’t want to destroy probiotics by cooking, a salad is our favorite way to use this. Don’t be afraid of changing some ingredients to reflect what you have on hand. As I write I’m eyeing a tray of Fuyu persimmons and may add a couple of those in a few days. The joy of a good fresh salad is each one is a bit different and indeed each bite is different. Preparation: Mix the above ingredients and it’s ready to serve. Any leftovers will keep one to two days under refrigeration. Don’t add salt until you have tasted as sauerkraut contains a good amount of salt. 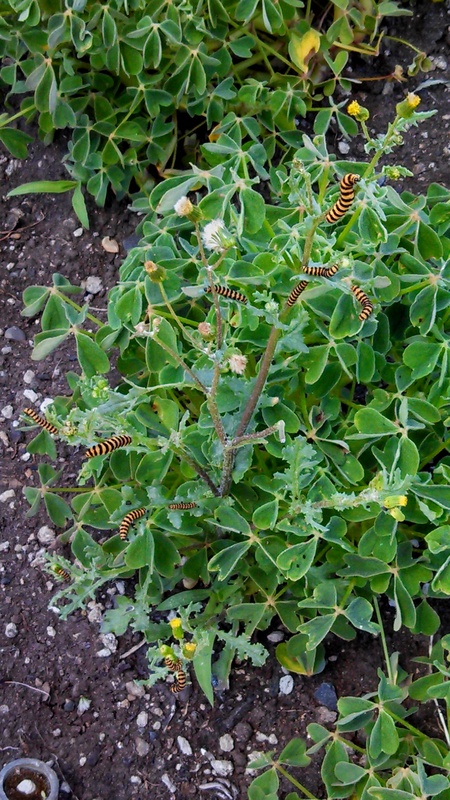 Started to pull a groundsel plant from an Oca bed and realized Cinnabar Moth larvae were actively defoliating it. Cinnabar moths, native to Western Europe, were introduced to Western Oregon some thirty years ago to control Tansy Ragwort, Senecio jacobaea and G alternate food source for moth larvae. Tansy ragwort is exceptionally vigorous, non native and will edge in and cover a pasture. The abundance of toxic alkaloids in ragwort can cause fatal liver damage in both cattle and horses. I’m leaving this weed in my garden to nourish these beneficial larvae but will clip off flowers and seed heads. The drama of nature plays out in the garden. For holiday potlucks we like to do a little extra. Set on a bed of tender greens, this salad combines reds, greens and white as a holiday theme. Roasted Beets: Peel, slice into narrow vertical strips, drizzle with oil, vinegar, salt and optional pomegranate molasses. Set in an inner ring over greens. Deviled Eggs: 12 eggs hard boiled. Yolks, mashed and combined with a rounded teaspoon Dijon or your favorite mustard, a quarter teaspoon of salt and black pepper. Fill eggs with yolk mix. If any of the whites hopelessly break apart just add yolk to mixture and set aside or discard the whites. As a last step place eggs. Parsley, rinsed and chopped, 1/3 cup…sprinkle over beets and salad greens followed by pomegranate seeds. Pomegranate Seeds: Purchase ready to use if possible. Used about 1/3 of a cup and provided a delightful crunch. Place eggs around salad and take to your event. Do not cover with plastic wrap, it will make a mess of the eggs. Sit it all on a large tray or cookie sheet in back of car. Roasting beets: I wrap them individually in foil and roast at 350 for about an hour. This time I made the mistake of not peeling shortly after roasting and that did not save time.